I'm so excited to reach 300 followers! It's time for my first giveaway!! 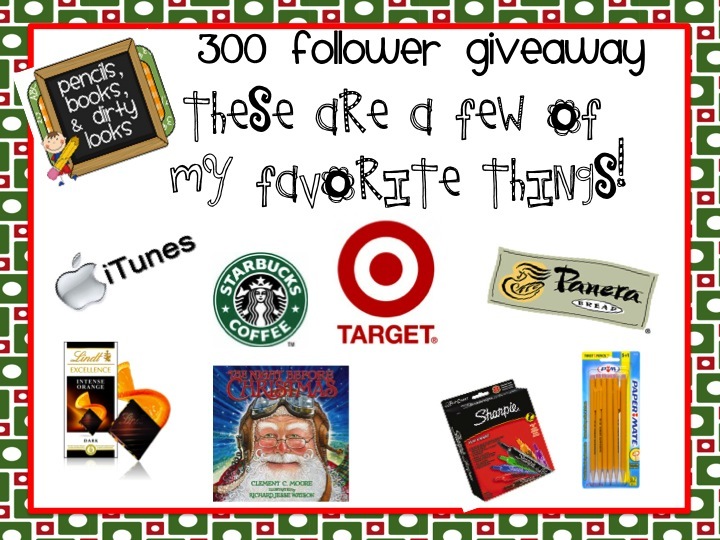 I decided to give away a few of my favorite things (I guess I'm in the mood for the holidays). 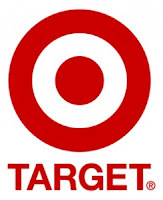 a $20 Target gift card... I love this store! a $15 Panera Bread gift card... Wonderful soups for this time of year! a $10 iTunes gift card... I couldn't afford to give away an iPad so I had to settle for a gift card! a $5 Starbucks gift card... Chai Tea Lattes make the world a happier place! A package of Sharpie Chart Markers and PaperMate Pencils... My favorites for the classroom! 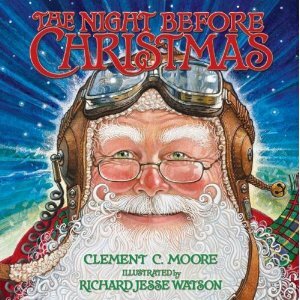 The book The Night Before Christmas... My favorite Christmas book! 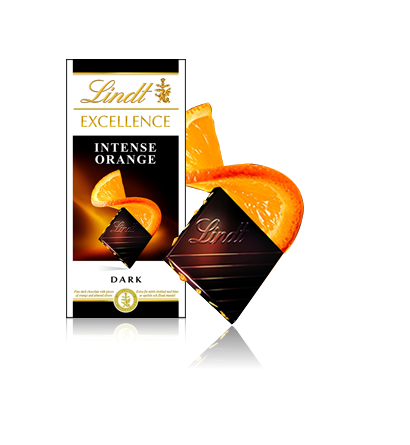 Lindt Excellence Intense Orange Dark Chocolate... Need I say more! 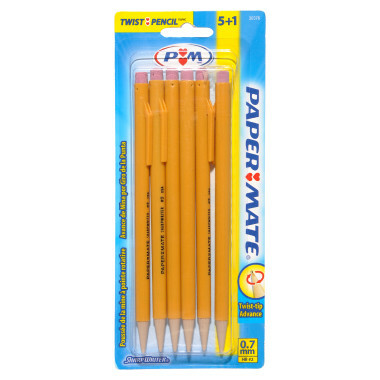 Any item from my TpT store... You choose your favorite item! Thanks SO much for following my blog and entering my first giveaway!! Uh..you have the best giveaway ever! I love Target..and itunes...and sharpies..and Christmas! Thanks for the opportunity! New follower here! :) I love this giveaway! It's like all of my favorite stores in one! Yay for giveaways! The this giveaway! I can't pick just one awesome item. Between Target, iTunes, and Starbucks you have lots of great giveaway prizes. Wow 300! I'm desperately trying to get to 100. I'm at 76 right now. Maybe by Xmas I can get to 100. You have great giveaways! I love Target and Starbucks. I've never been to Panera, is it like Corner Bakery? My favorite thing in the world (next to my fam) is probably chicken salad or chocolate. I love Jason's Deli Chicken Salad. Congrats on 300! My favorite thing in the world is pajamas. I know it sounds crazy, but I relish the thought of getting home and putting on my comfy pj's. That's me. PJ's are on my list as well! Is it bad that some days I'm in my pajamas as soon as I get home from school! Love the comforts of home!! Congrats on 300 followers and what an A-W-E-S-O-M-E giveaway!!! 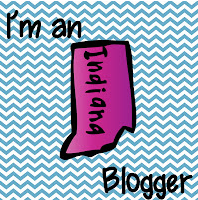 Happy to be a follower and part of your bloggy community! One of my favorite things is Thai food! Y-U-M! One of my favorite things is pumpkin anything in the fall! 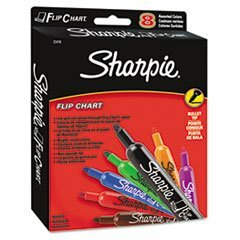 I love Target, iTunes, and Sharpies! Congrats on 300 followers!! One of my favorite things is Sponge Candy-a local specialty. What a fantastic giveaway! Congrats! Iced Coffee is one of my favorite things!! I love iTunes and having new music to listen to. One of my favorite things is getting new books on my Kindle. Congrats on reaching 300 followers! One of my favorite things are books. I have a Kindle but I love holding a book in my hands. Congratulations! I just discovered you through our linky! I am a proud new follower! Ooh, and one of my favorite things- Starbucks Coconut Mocha! Yum!!! Awesome giveaway, hope I'm the winner! What a giveaway!!! My fingers, toes & legs are crossed for this one! Congratulations! Congrats on 300! I just got there not too long ago. What a feeling!! One of my favorite things good fruit, but chocolate of anything usually trumps it all! Missed saying my favorite thing, can I say I love all of them??? One of my favorite things is sweatshirt weather. Congrats on reaching 300 followers! My favorite thing-sleeping late!!! Congrats on 300! I just became your follower 313 (my lucky number!). My favorite thing is to watch TV. Congrats on reaching the 300 mark!! One of my favorite things is coffee...lots and lots of coffee! Congratulations on 300 followers! What an amazing and generous giveaway! 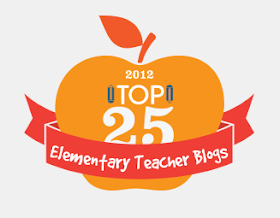 One of my favorite things is cool weather, warm coffee and great blogs to read! One of my fav things is chocolate!! Congrats on 300 followers! What an awesome giveaway! One of my favorite things is curling up on the couch with a good book. I love Panera!! So yummy! DIET COKE! My all time favorite thing in the world. . .especially from McDonalds! One of my favorite things is Hazelnut coffee. Thanks so much for the fun giveaway! 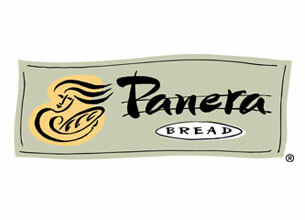 I love Panera Bread -- definitely one of my favorite things. They have great broccoli cheese soup and bread. Perfect for fall/winter! This is great! I love teaching kindergarten!!!!!! My favorite thing is Starbucks. At this time of year I need all the caffiene I can get, lol. 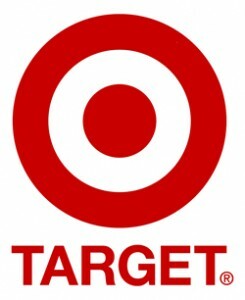 My favorite is definitely Target! hmm.. One of my favorite things... would have to be my Nook Tablet (does that count?!) I love to read and my husband bought it for me for my birthday this year! I love Target and iTunes!! What a great giveaway!! One of your newest followers! Great ideas! Looks like a great giveaway! I adore the name of your blog :) I'm now following. Congrats on the milestone! I love Target...and I have found the greatest deals there. Like my electric ice cream maker for $3.38. Yep. Full size. See how I could stretch that gift card? As a new teacher, anything is awesome to receive. Thanks for running this! 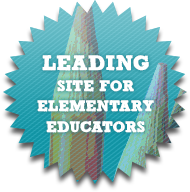 I love finding giveaways, for the goodies, but because i love finding new blogs!! I cannot believe I am just now seeing this GIVEAWAY!!! I'd love to win ANY of these prizes, but I would LOVE the Itunes Card! My favorite thing is winning giveaways :) My most favorite thing is my family....they are the greatest! 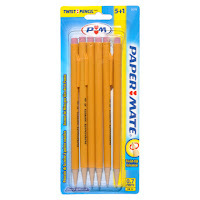 Wonderful giveaway Aimee!!!!! Come get this freebie from my blog if you'd like!!! I love Target, iTunes! Thanks for the contest! I am a new follower! My favorite Christmas book is Patrica Pallaco's Welcome Comfort! One of my favorite things is the delish Pumpkin Spice Lattes from starbucks- I also love the chai lattes too!! Congrats on 300 followers & what a wonderful giveaway! Being that I live on the hot desert, my favorite is jacket weather. But I also love cherry hersheys kisses, chai tea lattes, & watching shows I record on my dvr. Thanks for this chance & hope you get many more followers!! Congrats!!!! I love Starbucks, like you.